The Cabinet Ventilation Grille is a 17.5 by 6.1 inch metal grille that can be installed into cabinets and walls to help increase ventilation. It is the same exact dimensions as AIRPLATE S9 and T9 and can be used to replace their black mounting frames by using a phillips head screwdriver. The frames can also be used in conjunction with a fan system to act as a passive intake or exhaust vent. The kit includes three optional 120mm fan guards and hardware to secure three 120mm fans, the most popular size for computers and DIY applications, onto the grille. To mount your fan and grille into your cabinet or wall, you would need to cut a square hole approximately 15.75 by 5.35 inches. Features a CNC machined aluminum frame, pre-secured to a steel honeycomb grille, and four flat-head screws, all painted matte white. Information on the additional included hardware can be found below. Includes four wood screws and four machine screws with nuts to mount the ventilation grille onto a cabinet or wall. Also includes twelve 1.25-inch long machine screws with nuts to mount three 120 mm fans with the included three 120mm fan guards onto the ventilation grille. All screw heads are painted matte white to match the mounting frame. Is the exact same dimensions as AIRPLATE S9 and T9; and can be used to replace their black mounting frames. 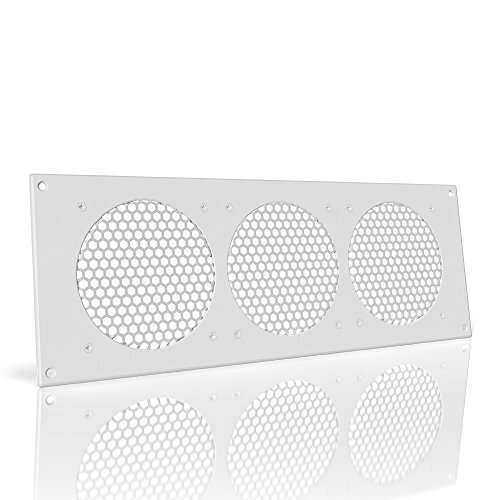 Features a CNC machined aluminum frame, honeycomb grille insert, and flat screw heads; all painted matte white. Kit includes (4) wood mounting screws, (4) machine mounting screws with nuts, (12) fan mounting screws with nuts, and (3) 120mm spiral fan guard. If you have any questions about this product by AC Infinity, contact us by completing and submitting the form below. If you are looking for a specif part number, please include it with your message.